On the way to the field site, participants stopped at to look at the pitcher plants. Photo by Randy Fowler, USFS. In June, seven representatives of five Tribal Nations joined USDA Forest Service and U.S. Army Corps of Engineers experts for the Tribal Wetlands Training workshop, hosted by the United South and Eastern Tribes, Inc.
Where does a wetland begin or end? Delineating the boundaries of a wetland is difficult. “Our goal was to help participants – who are themselves experts in ecosystem management for their tribes – to be able to identify forested wetlands and know who to contact for further guidance in delineating that wetland,” says Randy Fowler. Fowler is an SRS biological scientist at the Center for Forest Watershed Research and helped organize and facilitate the workshop. Hydric soils, hydrophytic plants, and unique hydrology characterize wetlands. Workshop participants learned about these characteristics in the classroom and in the field. Tyler Srgo and Tracy Sanders, soil scientists with USACE, led discussions about wetland function, characterization, and delineation, as well as the laws and regulations relevant to wetland management. Jason Jennings, of the National Forest System, discussed remote sensing with LiDAR and wetland management, restoration, and monitoring. “The LiDAR presentation was a big hit,” said Steve Terry, a senior project manager at USET, Inc. Terry led several sessions on water quality in wetlands. 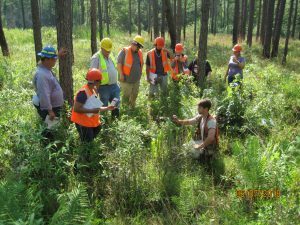 The workshop was held at the Santee Experimental Forest, which is part of the Francis Marion & Sumter National Forests. The Santee EF is a swampy place with a land use history that stretches back for centuries. In 1683, King Charles II granted the land to Thomas Colleton. Long before the Forest Service acquired the land in 1933, the bottomlands were part of a rice plantation. The group used soil augers to practice delineating wetland boundaries. Photo by Randy Fowler, USFS. 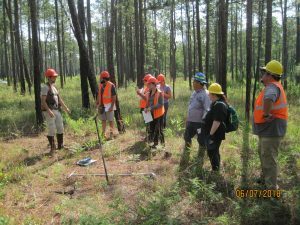 Today, the Santee EF is a long-term research site where Forest Service scientists and collaborators investigate the hydrology of coastal plain forests. The Santee EF is also part of the Experimental Forest Network. The workshop complemented the classroom discussions with a field component. Srgo led the field component and showed participants how to use Munsell soil books, augers, and other tools. On the first field day, participants walked through bottomland pine forests, crossed an intermittent stream, and arrived at a wetland. Equipped with Munsell soil books, maps, and augers, they estimated the wetland’s boundary. Wetlands vary, but all are part of the hydrological cycle. In a wetland, surface water and groundwater meet – and clean surface water may slip below ground, recharging the groundwater. The unique environment is home to plants and animals that would not survive in other areas. Carnivorous pitcher plants are one example. Pitcher plants require nitrogen, and since water-logged soils don’t contain it, the plants evolved – they acquire nitrogen from the insects they capture. Read more about the Santee Experimental Forest. For more information, email Randy Fowler at dlfowler@fs.fed.us.